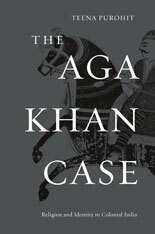 This September, Harvard University Press will publish The Aga Khan Case: Religion and Identity in Colonial India by Teena Purohit (Boston University). The publisher’s description follows. An overwhelmingly Arab-centric perspective dominates the West’s understanding of Islam and leads to a view of this religion as exclusively Middle Eastern and monolithic. Teena Purohit presses for a reorientation that would conceptualize Islam instead as a heterogeneous religion that has found a variety of expressions in local contexts throughout history. The story she tells of an Ismaili community in colonial India illustrates how much more complex Muslim identity is, and always has been, than the media would have us believe. In her analysis of the ginans, the religious texts of the Khojas that formed the basis of the judge’s decision, Purohit reveals that the religious practices they describe are not derivations of a Middle Eastern Islam but manifestations of a local vernacular one. Purohit suggests that only when we understand Islam as inseparable from the specific cultural milieus in which it flourishes do we fully grasp the meaning of this global religion.